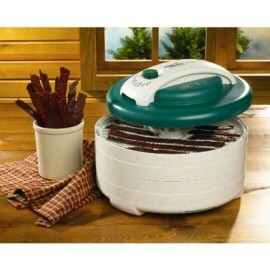 The Fabulous Food Dehydrator Series Part. 1: What is Food Dehydrator All About? In a world that is obsessed with fresh food, why on Earth would anyone want to dehydrate it, right? Wrong! While fresh food is best, you can still preserve a great deal of vitamins and nutrients naturally when you preserve foods using a food dehydrator! In the old days, our ancestors had various ways of drying meats and vegetables, none of which would seem very appetizing by today’s standards! Eww! But today, we are lucky enough to have food dehydrators to help us with this task and even make it fun. So what is a food dehydrator? If you are not familiar with food dehydrators, now is the time to make your acquaintance. Savvy shoppers and frugal chefs everywhere are starting to realize the money saving power of food dehydrators, and now it is time for you too! Below, you will find the basics about what a food dehydrator is. It should not be a machine that causes you intimidation or stress, but one that is fun and can save you a great deal of cash! Read on, and find out all you need to know! A food dehydrator is a device that removes moisture from food to aid in its preservation. A food dehydrator uses a heat source and air flow to reduce the amount of water in your foods. Pretty nifty! In most cases, the water content of food is usually very high. By removing moisture from food prevents bacteria from taking over and spoiling food. Dehydrators can easily extend the life of your food! A food dehydrator’s basic parts usually consist of a heating element, a fan, air vents allowing for air circulation and food trays to lay food upon. If you have ever seen one, you know they are rather compact! A dehydrator’s heating element, fans and vents go to work to remove moisture from food, heating the food first, releasing the moisture in it, and then pulling the moisture away. Sounds fancy! Are they expensive to run? This is the best part…No! In most models, the heating element in the dehydrator is controlled by a thermostat and provides just the right amount of heat to maintain a steady flow. The energy used depends on a number of factors such as surrounding temperature, the quantity of ingredients being dried, the moisture content of the ingredients, the size or thickness of the food and the drying temperature selected. Average drying times depend on a number of variables but many common dehydrator tasks will average out at much less than 24 hours! In most cases, it will only cost pennies to dehydrate a batch of product. This sounds like something I could just use my oven for, right? Wrong! Ovens don’t offer temperature control when dehydrating food, so it’s hit and miss trying to use a conventional oven. Generally, air circulation is important so if your conventional oven doesn’t circulate air, it simply won’t work. As you can see, dehydrating food should be left up to a food dehydrator! Can’t I just buy dried foods? Sure you can, but you will spend tons more! When you dehydrate your own, the main advantage is that you control selecting quality ingredients. You know exactly what is going into your food because you put it there yourself. The cost of store bought dried food is astronomical, with a 6 oz. bag of dried fruit costing you as much at $4.00 a bag. You could dehydrate a whole five pound bag of apples for that! Price beef jerky and herbs in the grocery store, then try making your own in a dehydrator. You will be amazed at the price difference! How long does it take to dehydrate my food? That depends. Dehydration times are determined by the temperature you want to dry at, the surrounding environment, and the size of the pieces of food being dried. So for example meat jerky could take 24 hours or more, while leafy veggie may only take a few hours. What exactly can you make in a food dehydrator? Well lucky for you, we are going to break this question down for you in an upcoming post! But did give you a quick peek, you should know you can make jerky, fruit snacks, dried fruit, dried herbs, crafting supplies, pet treats, and so much more! You will be surprised at everything you can toss into your dehydrator and get amazing results! Making your own snacks and healthy treats has never been easier. No again! Food dehydrators come in models that fit all budgets and needs. You can find simple or complex, and everything in between. The money you save using your food dehydrator will make it pay for itself over time. As you can see, a food dehydrator is a unique product that does a very special and valuable job! Preserving your food in a healthy and efficient manner has never been easier. If only our poor ancestors had access to an amazing product like this! Find out more about fabulous food dehydrators as this series continues. You will learn more uses for it, where to buy one, what models offer which perks, recipes, and more. If you want to start saving more money (and time!) in the kitchen, this is a series you won’t want to miss! Thank you for stopping by. This week I will be starting to share some simple recipes as well and then work on getting more complex as I go. Great information in your post. Your post is fabulous and thank you so much for sharing with Full Plate Thursday. Have a great weekend and come back soon! Love this series. 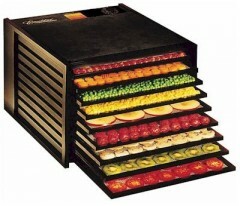 My Nana had a dehydrator (she was like the coolest up to date grandma I know!) and her dried apples were sooo good. I may have to consider get one soon for snacks for the kids! I love them to make fruit snacks and fruit leather (I love dehydrators for just about anything) because I don’t have to add sugar. Growing up we had a lot of apple and banana chips as we called them. The apples were my favorite as well because they stayed softer. Following you from one of the blog hops (maybe Nifty Thrifty Things?). Look forward to the dehydrator series. We bought one last summer but only used it a few times, because we really didn’t know what we were doing! I understand being a bit lost with the dehydrator. If I hadn’t grown up with one I would be lost as well. So many rules about what can be dehydrated and what has to be cooked to kill the enzymes before it can be dehydrated. I promise it’s not as hard as it really seems. Next week I will start sharing some recipes. I have a dehydrator that I’ve only used a couple of times…looking forward to the series so I can get some more ideas. I made beef jerky for the first time this week…it was really easy and good! I would be embarrassed to say how much beef jerky I make in my dehydrator, because I make it so often. It’s so good. I will be posting recipes for dried pineapple, yogurt and veggies soon. I need to actually measure the ingredients I use in my beef jerky so that I can share that recipe as well. It’s delicious and way cheaper than store bought! I think it saves me energy in the long run because I can run one less freezer. I dehydrate my vegetables and frozen fruit that would otherwise be taking up the space and needing a lay down freezer. I understand it can be a scary leap though. I absolutely LOVE my dehydrator and the kids do, too! I love my jerky recipe and will be posting it soon. 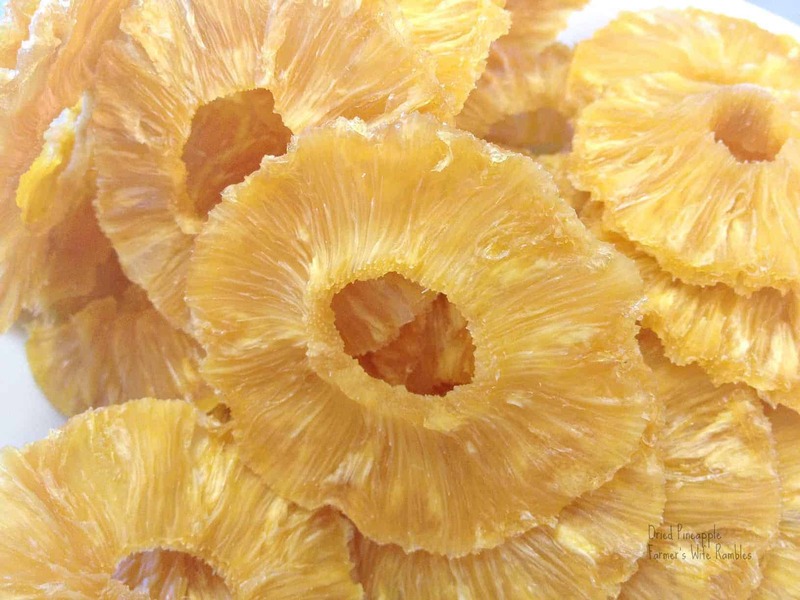 Dried pineapple is amazing and my boys think it is candy. Perhaps your grandson might as well. We haven’t dehydrated any foods of our own but we have friends that do. I think we may start sometime. My kids really like dried fruits. I’m looking forward to this series! I love dehydrated apple slices. We make them every year and the kids love them. Pineapple slices are my favorite thing dehydrated. I almost like them better than non-dehydrated. I grew up on apple slices, bananas and fruit leather that was dehydrated.